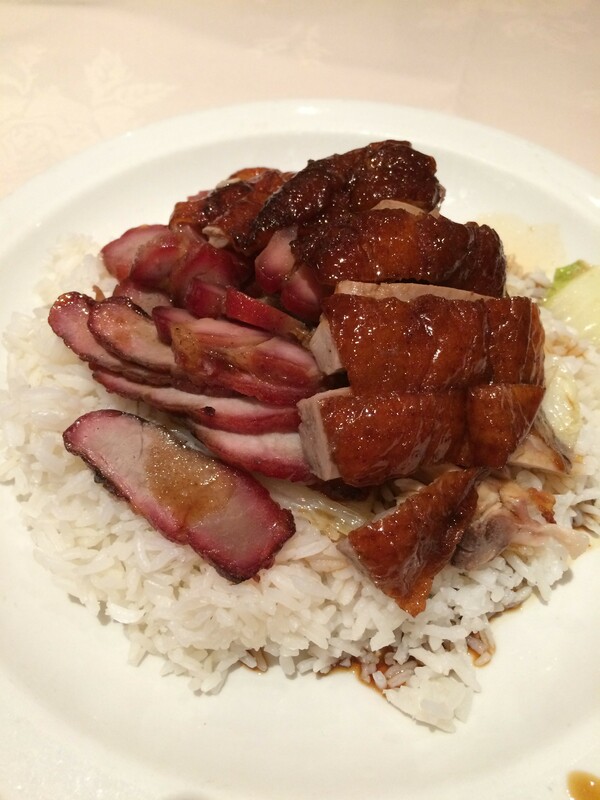 The race is on to find the most tasty roast duck in London. Rumor has it the chefs from Four Seasons moved to Goldmine. One of the authentic Chinese Hong Kong restaurants, along Bayswater. It is popular amongst the Chinese community, specializing succulent BBQ juicy meats hanging by the shop window ready for you to be butchered on your plate. I managed to book a table on the same day for the evening around 7pm, a wise choice since by the time it hit, many people were coming in and out the place. It’s not a overly fussed place, the interior has simple round tables ideal for big groups and family for sit down meals. Ordering my favourite dish of three BBQ meats and rice, there’s the usual choice of a peking roast duck, soy chicken, crispy belly pork and BBQ pork. It’s a simple dish with tons of meat, topped on steamed rice with a sweet sauce poured over. Peking duck beautifully done, fragrant, tender meat with a thin crisp skin. Char siu soaked up the sticky sweet savory flavours. Underneath, a bed of steamed vegetables seem like a standard thing.